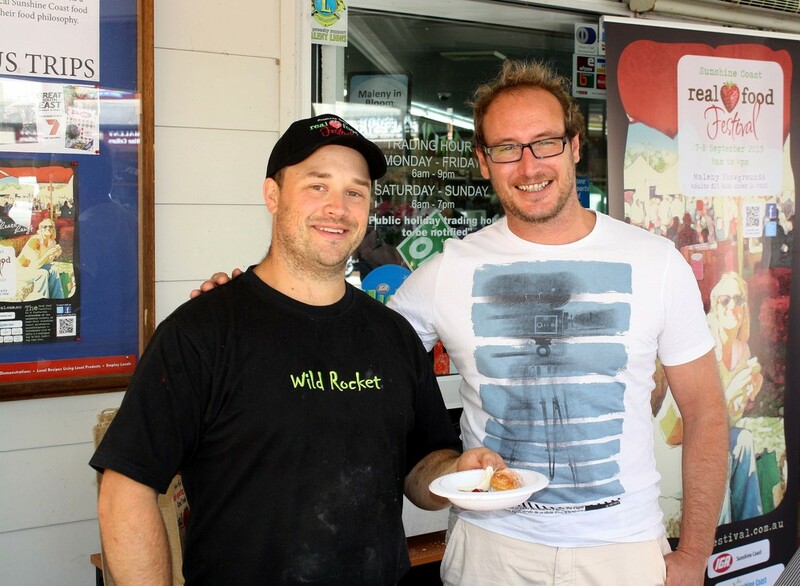 Local chef and owner of Wild Rocket, Peter Brettell was serving up delicious, freshly cooked donuts, with a local strawberry compote and Colin James ice-cream at the Maleny IGA last Friday morning 30th August; a tasty brunch treat for shoppers and passers by. For those that just happened to find themselves in ‘the right place at the right time’, it was a delightful surprise. 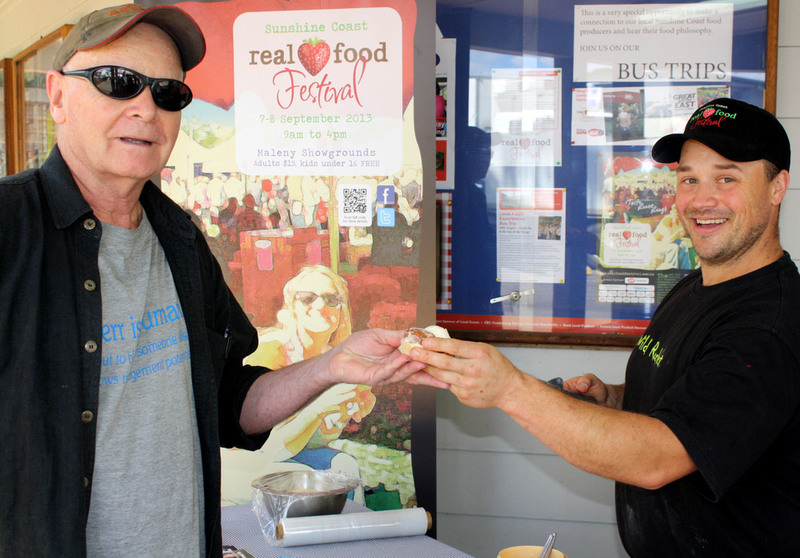 As one of the sponsors of the event, the Maleny IGA was happy to host The Pastie Pom, Pete, as he wowed shoppers with his yummy treat and cheeky grin. Rob had simply one word to describe the dessert – “Sensational. You can’t go wrong with freshly made donuts!” he said. Another shopper enjoyed it so much she asked for the recipe! 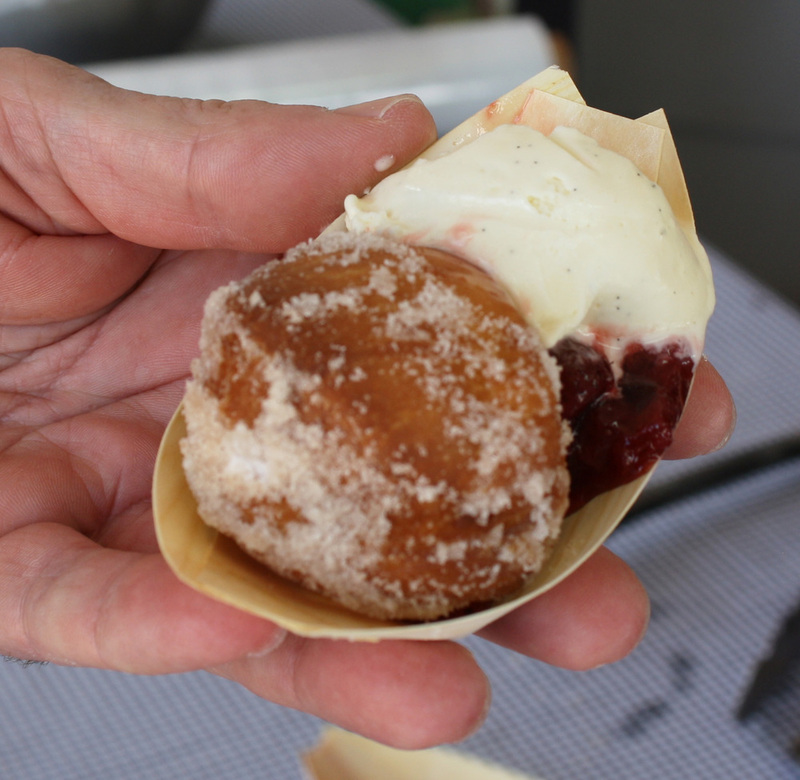 Peter will be at the festival with some of the Wild Rocket team, and is bringing back the famous Hazelnut Crusted Prawns from last year, and for dessert he will be teaming up the strawberry compote and Colin James ice-cream with a white pannacotta in a delicious marriage of flavours. He will also be appearing as one of the chefs at the festival, demonstrating how to make delicious, light gnocci from scratch, at 2:30pm on Sunday at the Kunara Real Food Kitchen. So get along and pick up some tips from him. Food stylist and chef, Chris Klaas stopped by to check out Pete’s dessert, and said he was looking forward to his food photography workshop at the festival, and invited people to bring their own camera and participate. To view the program for the Real Food Festival go to realfoodfestival.com.au/2013-program/ CREATIVE COMMONS COPYRIGHT FOR THIS ARTICLE Maleny IGA Real Food Festival Taster by Maleny Supa IGA is licensed under a Creative Commons Attribution-ShareAlike 3.0 Unported License. Based on a work at http://www.malenyiga.com.au/wordpress/maleny-iga-real-food-festival-taster/.